iCan Bike is a camp that teaches children, teens,and young adults with disabilities how to ride a two-wheeled bicycle in one 75-minute session for five days. iCan Bike (previously known as Lose the Training Wheels) uses adapted equipment, trained professionals, and volunteers. Within the five days, over 80% of participants learn to ride a conventional bicycle independently. The camp is run by the professionals of ICan Shine with help from local volunteers. Check out the ICan Shine video library. iCan Bike is more than just a bike-riding program. For many children with disabilities, learning to ride a bike is a seemingly impossible task that they can typically master in less than a week’s time during this camp. Within days of learning to ride, many children exhibit independent behaviors for the first time ever. This achievement, in turn, creates a gateway of opportunity, helping them gain assurance and self-reliance in many other aspects of their lives. 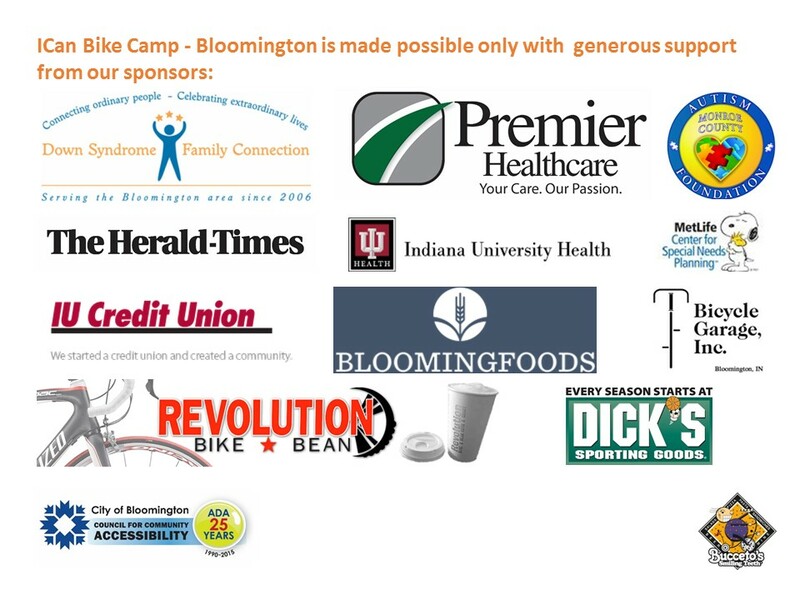 Check out this video from the Bloomington Herald-Times about the iCanBike Bloomington camp. There were some good articles about the camp, in the IDS, and the Herald-Times. Thanks for the coverage! And here's a video from the HT. See our story in this Indiana Daily Student article: "Everyone can ride". A new an additional method for donations is now available at our gofundme site! Bike to Work Day BlockParty at Bloomingfoods (near westside location) 530-800, May 15! (flyer). Proceeds will go to iCanBike-Bloomington. Find more info at the Bloomingfoods Events Page. Come out and visit , listen to music, hang out with bicycle people, and support us! 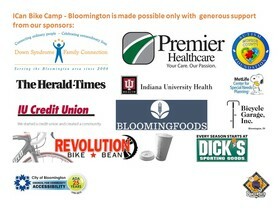 Come visit us at the Active Living Coalition Fair on May 30, 9-12, at the Bloomington Farmers Market. Rider registration forms: Online form, pdf form. Volunteer registration forms: Online form, pdf form. Sponsorship forms: Online form, pdf form.